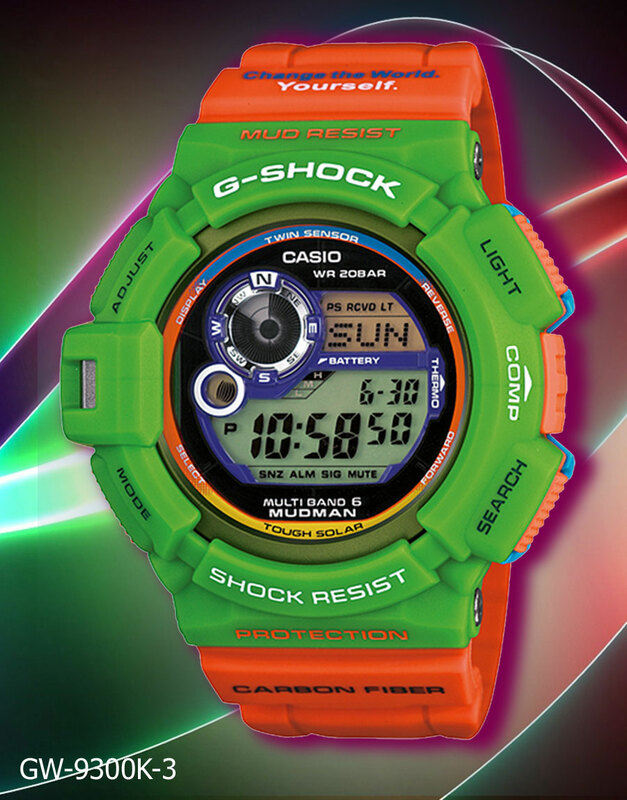 A good year for G-Shock fans, 2012 is loaded with excellent collaborations that span the product mix with myriad colors and fashions. 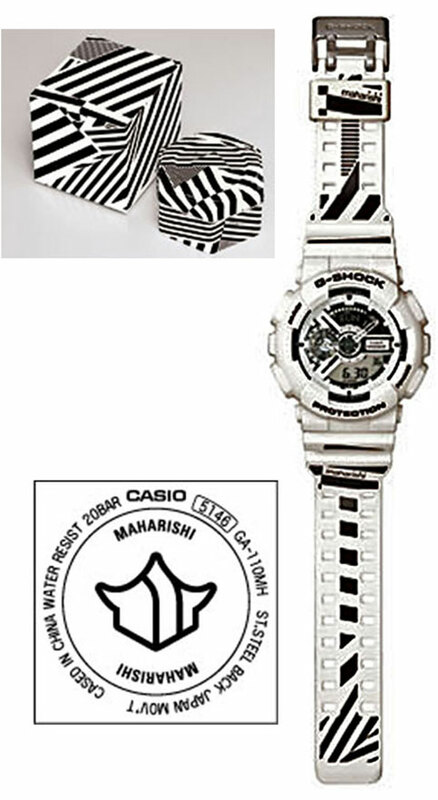 This GA110, white with black printed designs on the strap is signature “Maharishi” and is well worth acquiring for your “collectibles” drawer. 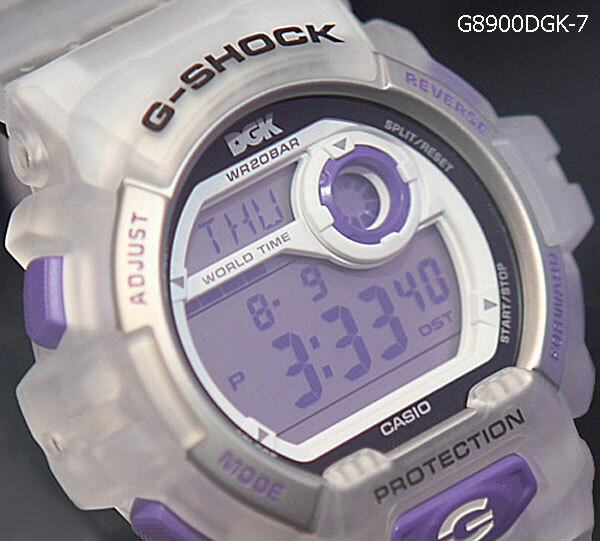 This product was announced on June 26, 2012 to be available soon in the US for $150 at Macy’s, Tourneau, Tappers, Hamilton, Fashion Time, Altivo, Tilly’s and http://www.gshock.com. “Maharishi” in the SOHO area of London. 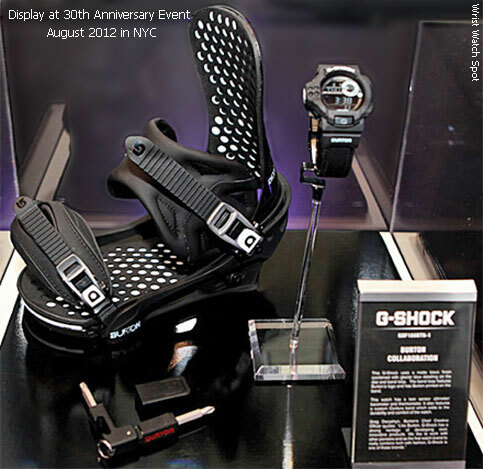 Snowboard enthusiasts know Burton for their upscale gear – boards, boots and cold weather apparel. 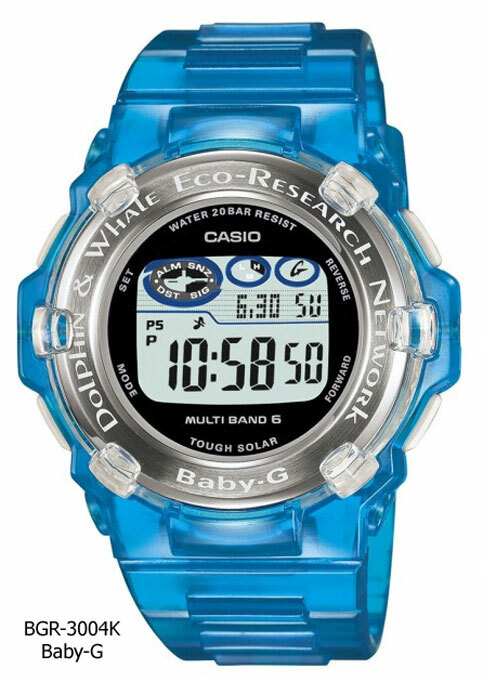 technology that is so handy for this winter sport. 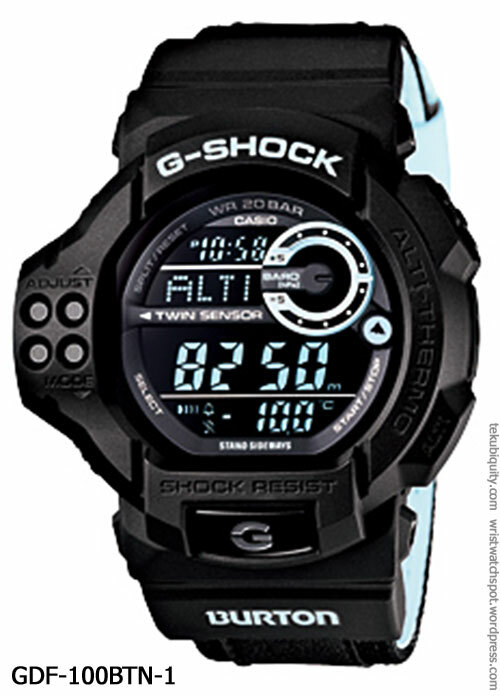 The G-Shock model GDF100BTN-1 features altimeter, barometer and temperature readouts. mountainside sport. 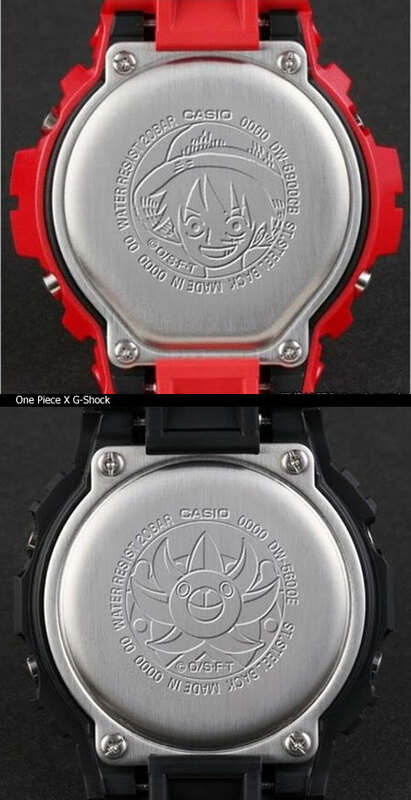 Release of this watch is expected December 2012. 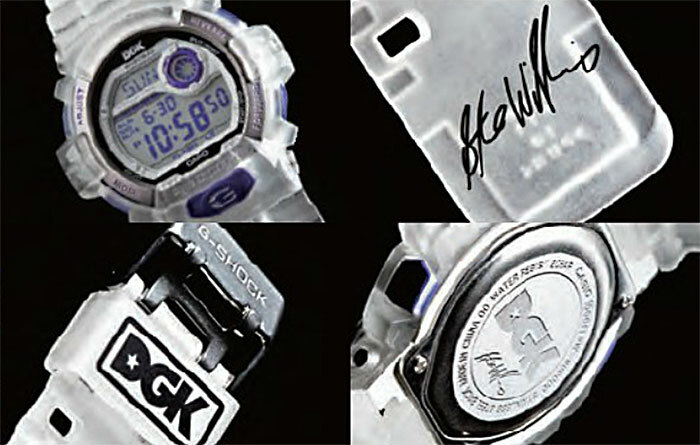 Casio is set to launch another collaborative G-Shock design with street skater Stevie Williams early part of next year. 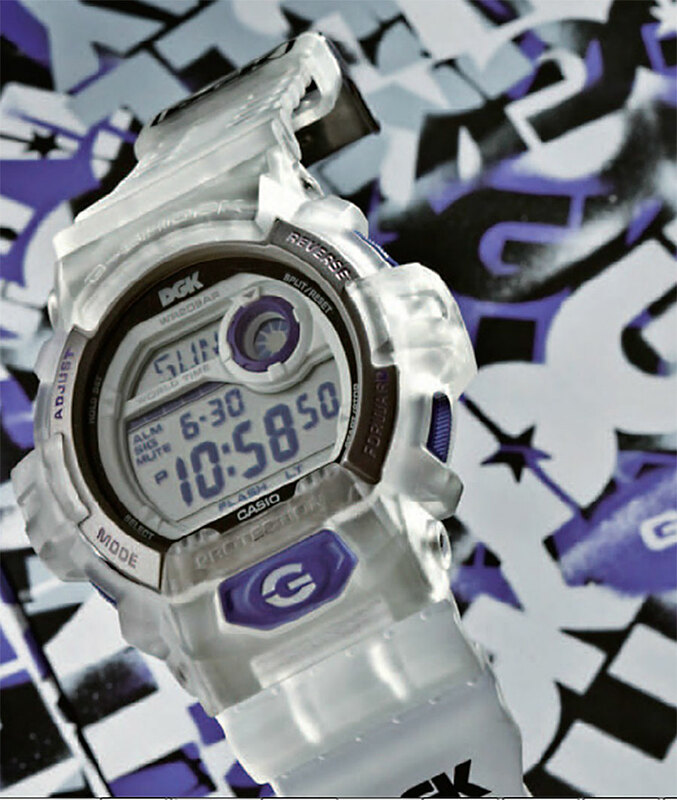 A sophomore collaboration between the two entities, the DGK x Casio G-Shock G8900DGK-7 Watch features the signature purple accents from Williams’ own DGK (aka “Dirty Ghetto Kids“) skate lifestyle label, on a translucent polymer watch encasement. 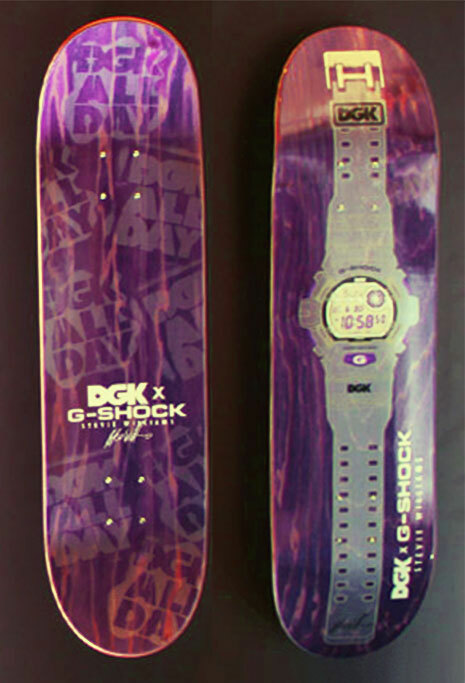 To feature packaging specifically designed for the special edition along with matching skate deck from DGK, the watch will be available January 2013. 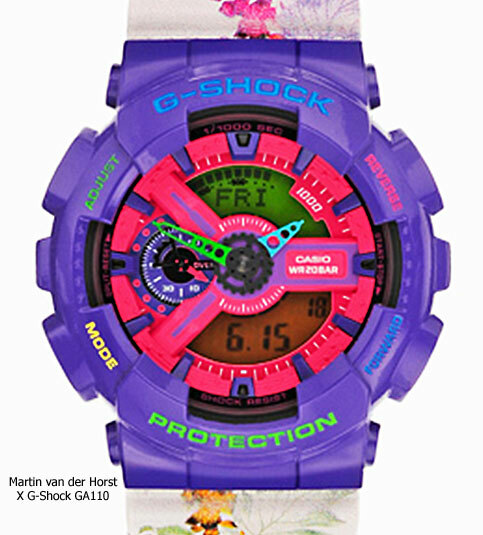 As first reported by HYPERBEAST in June, Fashion East with Maarten van der Horst collaborated with G-Shock to produce a very colorful GA110 that they offered for £250 GBP at G-Shock East. 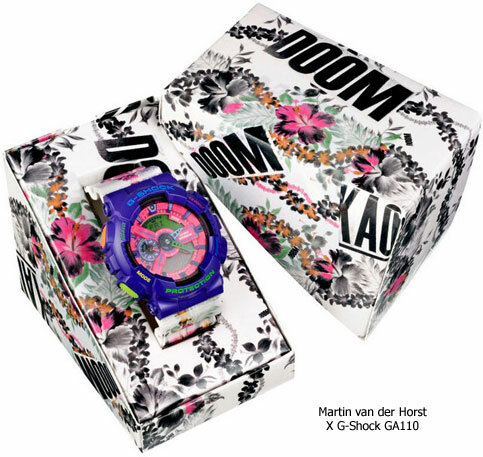 Martin van der Horst X G-Shock – Fashion East, sponsored by Topshop, who in turn sponsors new designers. It’s a little complicated, but it certainly works for Martin. 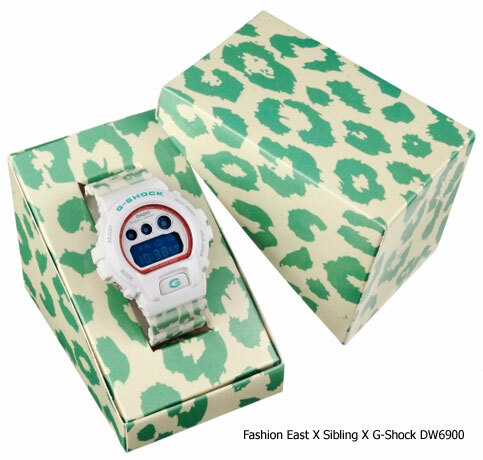 Also, a Fashion East, this one with Sibling features a DW6900 watch that starts life in white and is enhanced with a soft green leafy print. 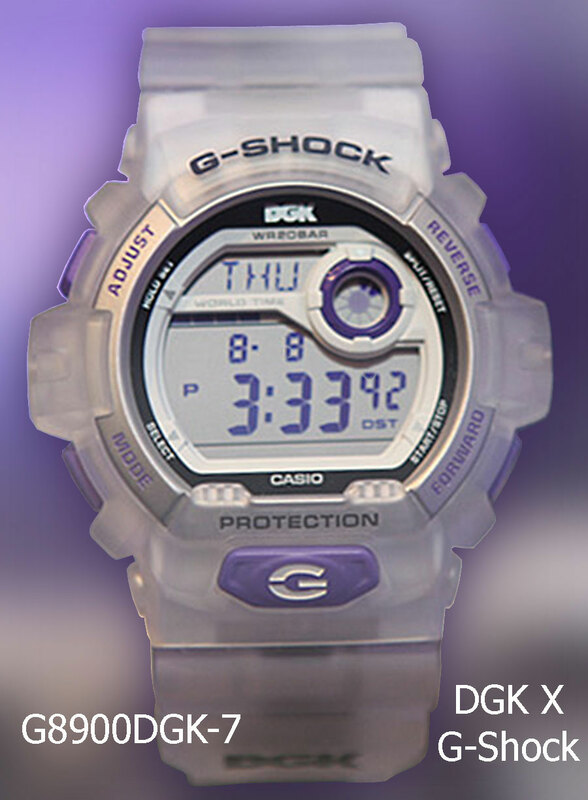 It’s anyone’s guess whether it is meant for men or women – maybe one of you readers can tell me? 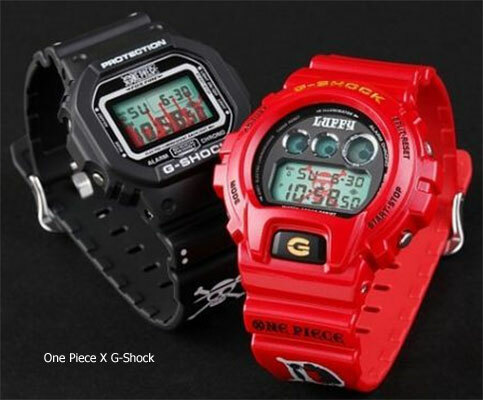 In4mation joins up with G-Shock again (this would be their sixth time) to give us a dual-branded white case and strap with black dial surfers’ G-Lide GLX-150X-7JR with a bright red strap-keeper. 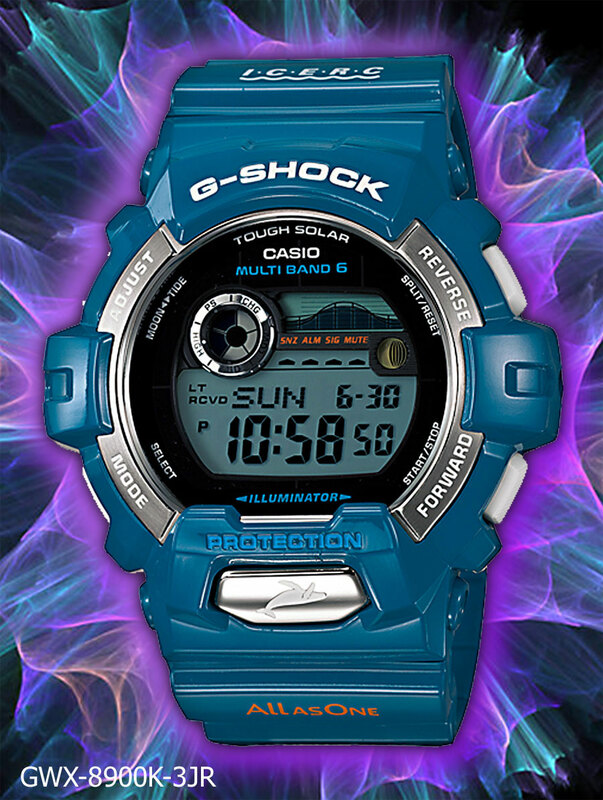 This model has been announced to be distributed in the US at Macy’s, Tourneau, Tilly’s, In4mation Hawaii, Independent Jewelers, Fashion Boutiques, and http://www.gshock.com. 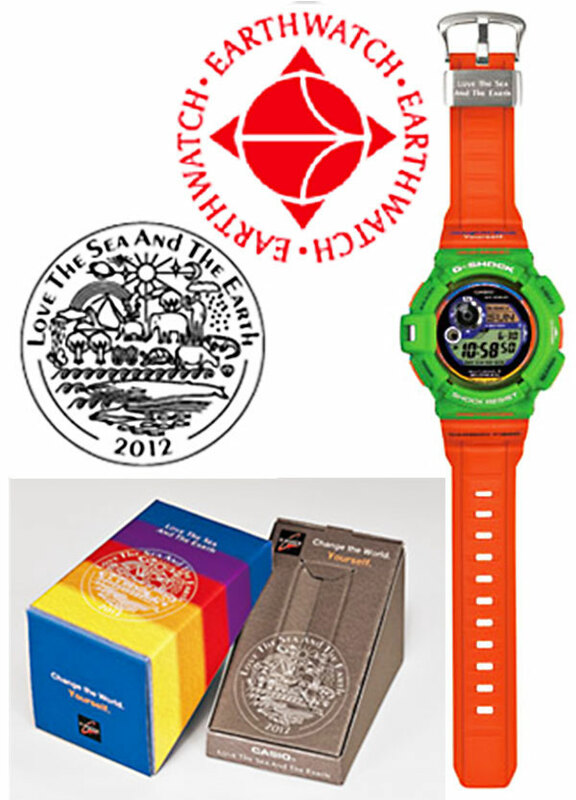 and a digital compass to help us find our way in the murky waters or our time. 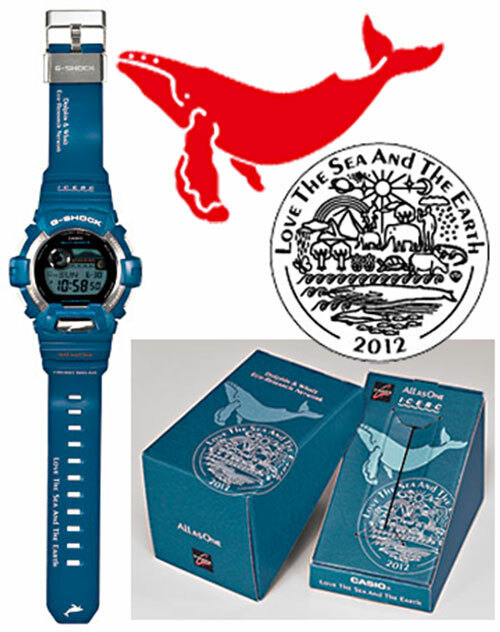 Another collab of “Love The Sea..” is the GWX-8900K-3JR – this one with the I.C.E.R.C. 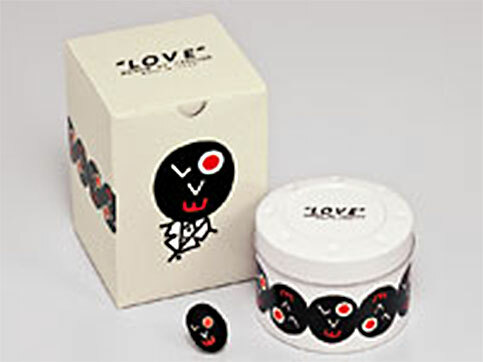 but collectible and reasonably priced. 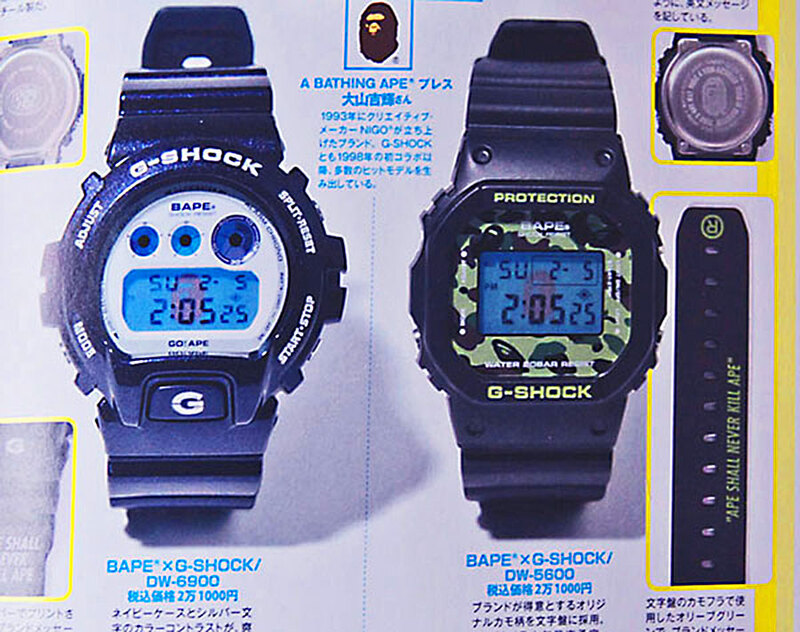 BAPE offers up two new watches. 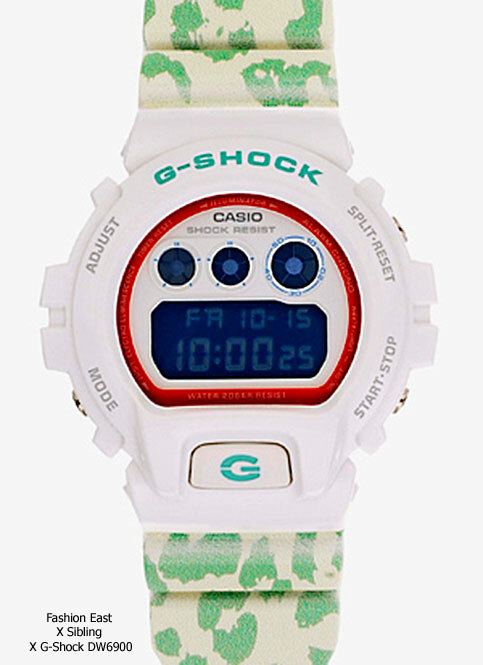 One is a G-Shock collaboration, a model DW6900 in blue resin and white dial, the other, a BAPE branded “Field Watch” (not a G-Shock) that comes with two fabric bands (olive and blue). 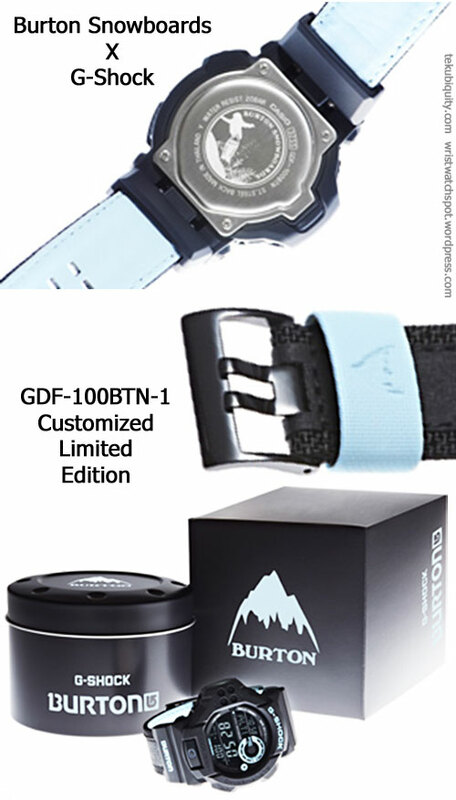 Not much information has been shared with us about these products, but we thought you’d like to have the press release pictures to check out. 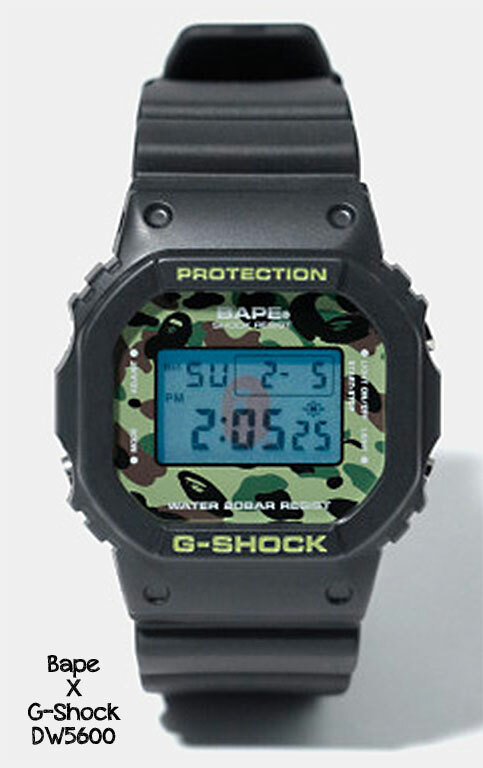 Also by way of a sorta “back-fill,” a picture is included of the BAPE Camo DW5600 watch that they started to sell around the end of May. 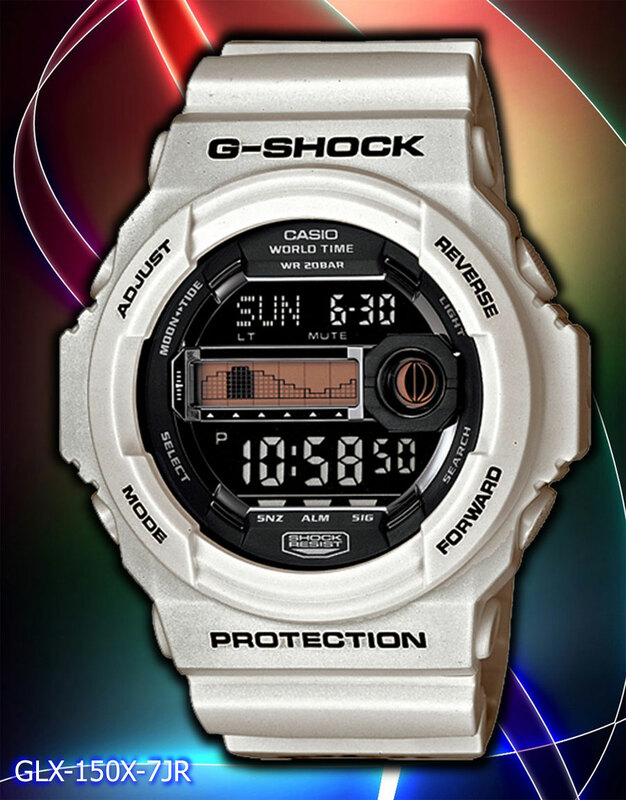 You have to hand it to these guys; they take the cheapest low-end models, minimally re-brand them and sell them for premium bucks. And, they always sell out fast! Unbelievagable. 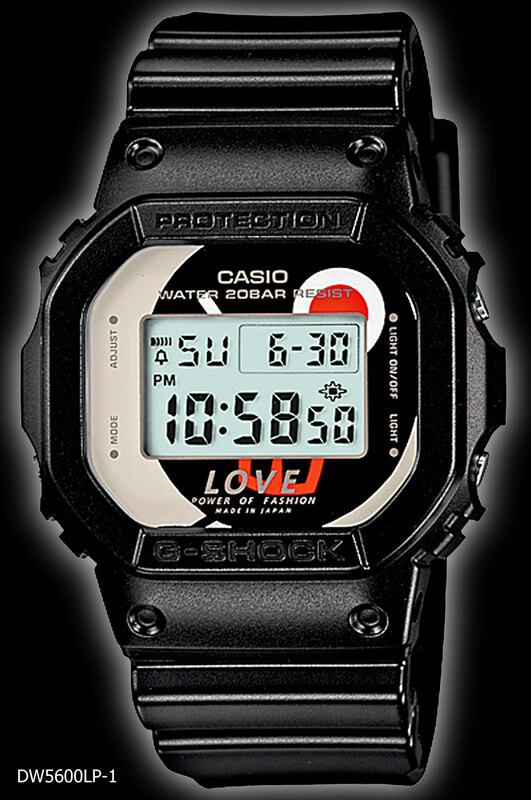 A collaborattive effort between Filip Pagowski, the limited edition ‘Love Power of Fashion’ DW-5600LP-1JR that’s been released to raise funds for Japan’s earthquake release effort. 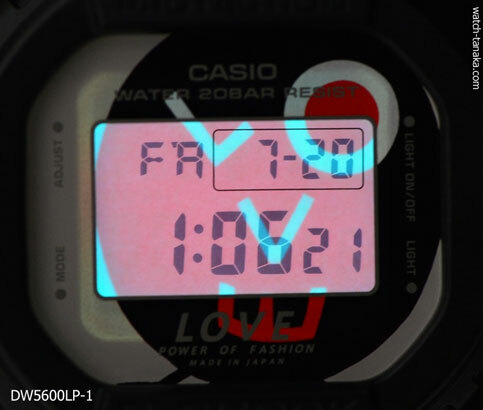 The backlight completes the iconic winking face designed by Pagowski who is known primarily for his designing for Comme des Garçons’ Play. 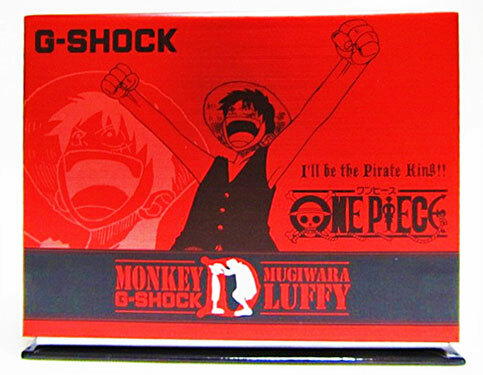 benefactor of Shanks Luffy Straw Hat Luffy deposit. 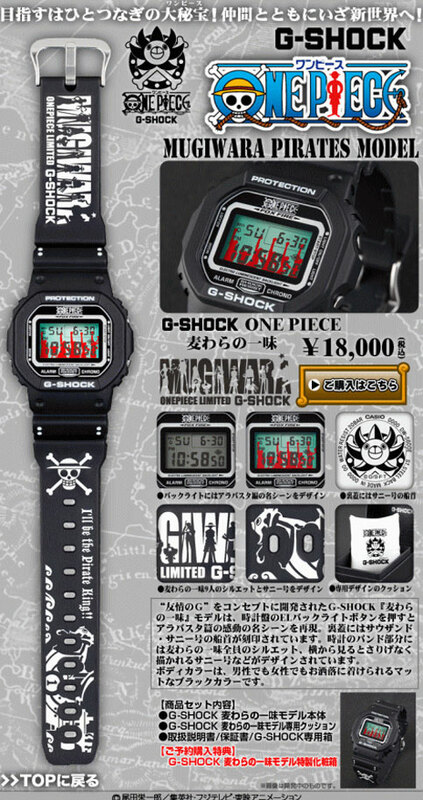 “Finally realized the dream of becoming a long-awaited collaboration G-SHOCK fans and One Piece! 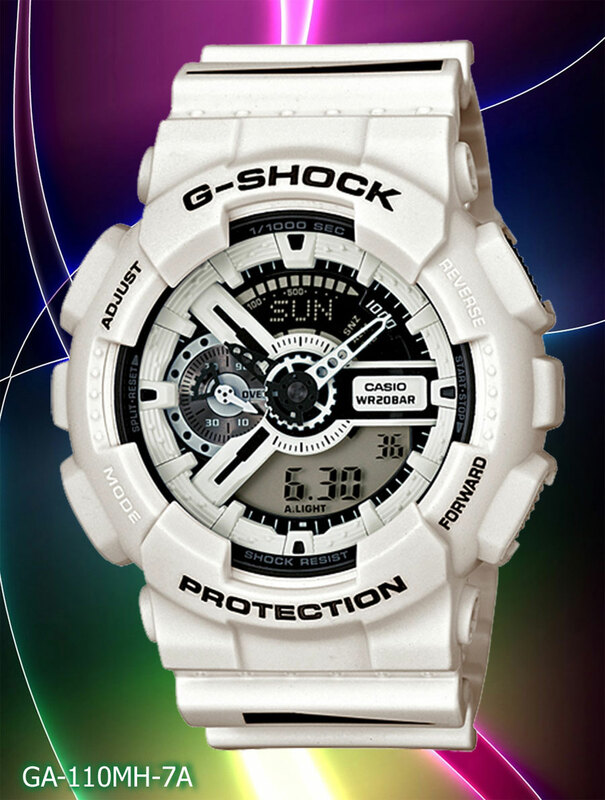 excitement of Hen Alabaster Press the EL backlight button the face of a clock reproduce the scene of the name. 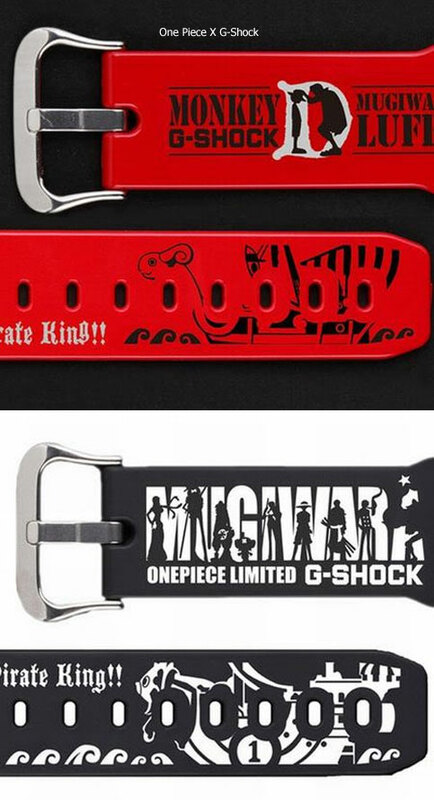 casually look Straw silhouette of all, from the side has been designed. 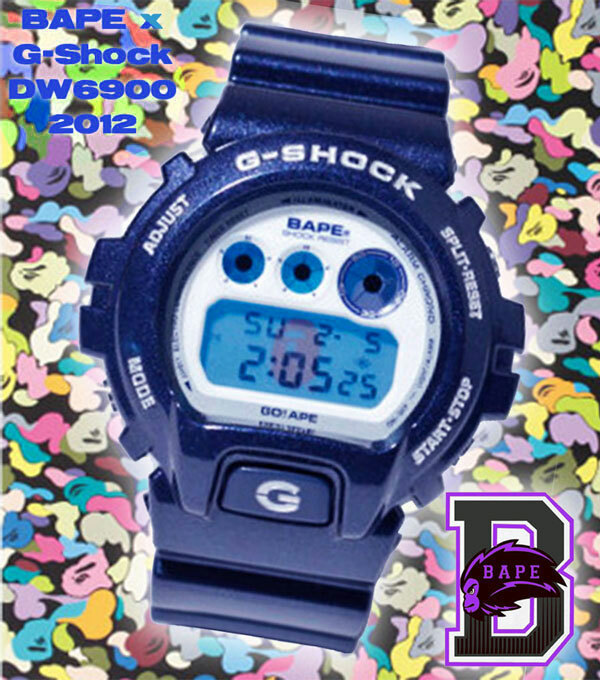 Body color is a matte black color that is also fashionable wear for men and women.” This watch is sold out. 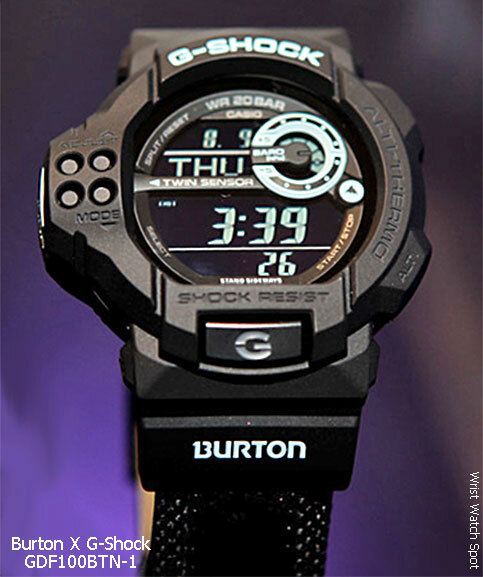 poll – what watch will lance armstrong wear now that his situation has changed? 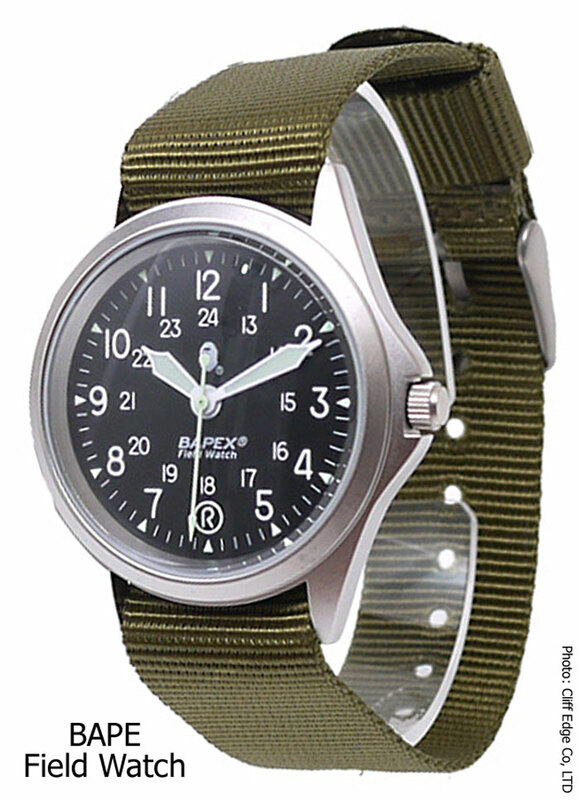 which watch would jennifer aniston give to her co-stars?